Legal prostitutes, legal marijuana, canals, and lots of windmills, right? The Geitenboerderij Ridammerhoeve is one of my new favorite places. Nestled in a huge city park called Amsterdamse Bos, this goat farm is part petting zoo and part working organic farm. Going for a ride. Who's driving? They have lots of goats of course, and from these goats they get lovely milk which they make into cheese, yogurt and ice cream. They also have lots of nice chickens running around whose eggs they sell. In addition to chickens and goats, the farm is also home to a few cows, pigs, and a horse. In their shop they sell the goat cheese, milk and other products, as well as the biodynamic eggs, and a variety of meats. I picked up a package of ground goat meat, some cheeses and a whole bunch of eggs. I couldn't resist the goat cheese with nettles. So yum! I've been eating the eggs all week and they are fabulous! With factory farming so horrifying, it is such a relief to see the chickens running around freely and pecking about in the dirt and grass for their food. I just feel GOOD eating these eggs. I know where they come from and I feel happy about the lives of the animals. Plus they are tasty and fresh. We've been going through these eggs more quickly than usual. Unfortunately that means soon I'll have to take the hour long bike ride back there to get more. But I don't mind visiting the cute baby goats again, even though one of them tried to eat my jacket when I wasn't looking. 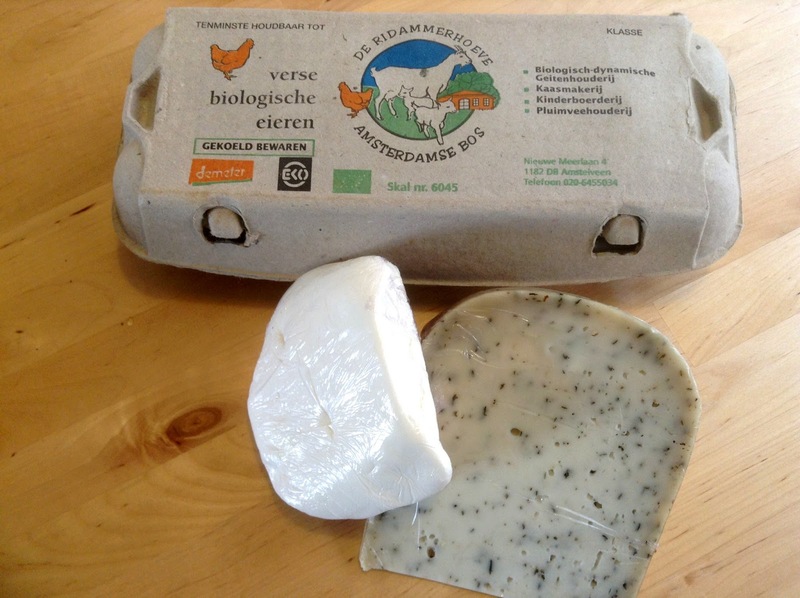 Any Amsterdam readers know of any other local farms that sell directly to consumers? I've heard of a few and plan to check them out as soon as the weather improves. Rain rain go away!